Retail $216.98 SAVE 13% ! 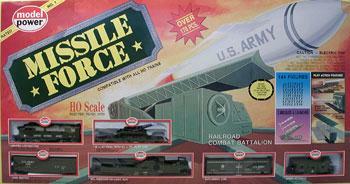 I bought this set because i liked the trains in it and always wanted a military train. I managed to blow up the ammo-exploding boxcar and still havent re-assembled it, probably due to lack of dexterity. Other than that i am very happy with the engine and the other cars that came with it. Just be careful with that ammo-boxcar that explodes on strong impact (like dropping it like i did). Lighted 8-wheel drive diesel locomotive for greater pulling power also with a metal chassis and 8-wheel pick up..
M-47 tank with 51 ft. flat car: tank is removable and turret rotate 360 degrees.. Tank buster with two drop-down sides that reveal two anti-aircraf guns, plus guns pivot horizontally 90 degrees for realistic action..
Big Thunder Railway with realistic operating Howitzer railway gun an operating wheel which raises and lowers the gun..
Exploding car which pops apart when hit by a missile; it's safet tested and easy to use..
Army caboose is a wide version style and a personnel carrier..
Missile launcher with three missiles, which fire at command fro launcher..
Steel alloy track features easy snap-together assembly, operates o hard floors, tables and carpets, and requires no screws, nails, o special needed tools..
18" radius terminal rerailer with wire..
36" x 45" oval of track with hook up wire and power pack..
Power pack: Input: 120V AC60Hz, Output: 19V AC 0 - 18VDC 5.5 VA.. Compatible with all HO trains.. Train kit includes over 170 pieces..
Model Power catalog accompanies the railroad combat battalion kit..
Precautions should be observed during handling and use to preven electric shock..
Do not over oil the locomotive.. Remove plug when not using transformer..
See troubleshooting guide in instructions for certain problems.. It is not recommended to run train on a carpet surface..